The Nutron R32 and R32 LX include many of the great features that today's consumer is seeking. Traditional rear-wheel drive and compact design enable the R32 and R32 Lx to easily maneuver and negotiate obstacles inside and outside the home. When the consumer wants to travel, both models fold for easy transport. Low 17 3/4" seat-to-floor height option. Folds to 13" wide for easy transport. 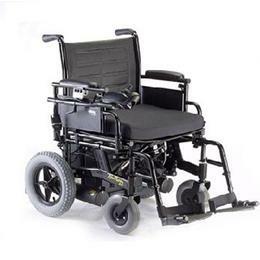 Wheels - Front casters (standard): 8" x 2"
Wheels - Front casters (optional): 6" x 2"
Weight (with 22NF batteries): 150 lbs. Weight (without batteries & front riggings): 79 lbs.